A controversial article looking at former U.S. Fed Chairman Alan Greenspan’s role in the easy money systems which have pervaded the U.S. and the world economies – and his recent disavowals of these systems in retrospect. While the article is primarily directly relevant to the U.S. economy, it has parallels within any nation which has implemented similar monetary easing. The views expressed are those of the author and not necessarily those of the owner of this website. Under certain circumstances, seemingly decent human beings are capable of horrific things. So it is with Former Federal Reserve Chairman Alan Greenspan, who parlayed his sound money bona fides into the top post at America’s private banking cartel and current issuer of our un-backed currency. In betrayal of his own stated free-market principles, Greenspan spent his tenure at the Fed pumping up financial markets with easy money and enabling runaway government spending commitments. Today, however, the “maestro” of central banking is playing a very different tune. He’s warning against an inevitable crisis resulting from the very policies he helped implement. Perhaps it’s a late-life crisis of conscience. Perhaps he feels guilty. Perhaps at age 90, he just feels free to speak his mind in a way that most current and former Fed officials don’t. 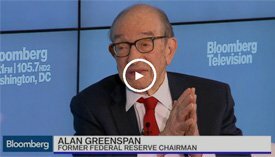 In any event, Alan Greenspan is very concerned about the legacy he will leave and now seems genuinely worried about the country’s financial future. As global stock markets protested, the gold market surged to new 2016 highs post-Brexit. The success of Brexit, which defied the predictions of pollsters, may bode well for Donald Trump. His unconventional campaign for the presidency hits on similar anti-globalist, anti-establishment themes. Meanwhile in Congress, renegade Republican Rep. Thomas Massie is pushing what he calls an “Amexit” from the United Nations. Massie’s American Sovereignty Restoration Act (HR 1205) would allow the U.S. to leave the United Nations and cease sending $8 billion per year in “contributions” to the world body. Anti-establishment politics irks elites in central banking and elsewhere who institutionally prefer the status quo. But what really worries former Fed chair Alan Greenspan isn’t the upcoming election or any bill in Congress. 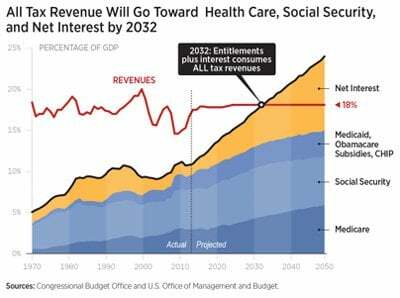 It’s the $19+ trillion national debt and the trillions more in future spending commitments that are already baked into the cake. His pessimism stems from the political reality that elected representatives lack the will to address entitlement spending. “Republicans don’t want to touch it. Democrats don’t want to touch it. They don’t even want to talk about it. This is what the election should be all about in the United States. You will never hear one word from either side,” Greenspan told Bloomberg. He is right, of course. Even self-described “conservative” Republicans who tout smaller government in principle don’t actually vote for it in practice. Mathematically, they can’t. Once you rule out cuts in military and entitlement spending, as most Republicans do, what’s left on the table to cut is small potatoes. Going after waste, fraud, and abuse isn’t going to stop the bleeding of red ink as millions of Baby Boomers withdraw from the workforce and expect to collect trillions in unfunded benefits that have been promised to them. The good news (if you’re a politician) is that under our monetary system you don’t ever have to cut. You don’t have to ensure that your promises of future benefits can be met with revenues. You can be as fiscally irresponsible as the Federal Reserve’s willingness to expand the currency supply permits you to be. The Fed stands ready to buy up government bonds in unlimited quantities, making a sovereign default practically impossible and enabling the government to borrow at artificially low interest rates. The government debt bubble is a product of the fiat monetary system. Under a gold standard, Congress would be limited by what it could actually extract from the people in taxes. 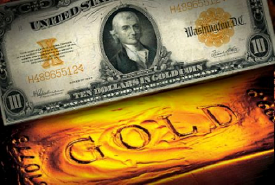 The self-described “gold bug” economist quoted above is none other than Alan Greenspan! Yes, the longest-serving chairman of the world’s most powerful fiat money establishment. The same Alan Greenspan who helped both Republican and Democrat administrations drive up the national debt from $2.4 trillion to $8.5 trillion in the years 1987-2006. The same Alan Greenspan whose implicit open-ended backing of U.S. debt markets helped Congress grow unfunded liabilities by untold trillions more than is even reported in official debt figures. The same Alan Greenspan who engaged in shocking interventions and currency devaluations, starting with bailing out Long Term Capital Management in 1998 and followed by a blowing up of the tech bubble, and, after its crash, the housing bubble. Why Did Greenspan Commit His Horrific Monetary “Crimes”? At last, Greenspan sees the light. Perhaps in private he always did. Before he helmed the Fed, he was known as a free-market advocate who associated with novelist-philosopher Ayn Rand and strongly favored a gold standard. But unlike a Randian hero, Greenspan compromised his principles in his pursuit of power, fame, and social status. Why did Greenspan play a key role in undermining sound fiscal policies and sound money while he was at the height of his power and influence at the Fed? Why did he do so much to fuel asset bubbles and reckless debt spending? Only Alan Greenspan himself knows for sure, but we’re the ones paying the price. *Stefan Gleason is President of Money Metals Exchange, the national precious metals company named 2015 “Dealer of the Year” in the United States by an independent global ratings group. A graduate of the University of Florida, Gleason is a seasoned business leader, investor, political strategist, and grassroots activist. Gleason has frequently appeared on national television networks such as CNN, FoxNews, and CNBC, and his writings have appeared in hundreds of publications such as the Wall Street Journal, TheStreet.com, Seeking Alpha, Detroit News, Washington Times, and National Review. Previous Article UBS: Gold set for bull run but….